WE HAVE HAD a beautiful, busy, Spring and Summer this year at Hall’s Pond Sanctuary. 2014 was busy all year long, and with the May 4th Community Day, the May 18 dedication of the Eris Doorneweerd Entry to the Sanctuary, and the June 16 Annual Meeting (featuring historian Susan Helms Daley’s presentation “Who Was Harriet Hemenway”) the Friends have been active not only in the sanctuary but also out in the community on behalf of the sanctuary. 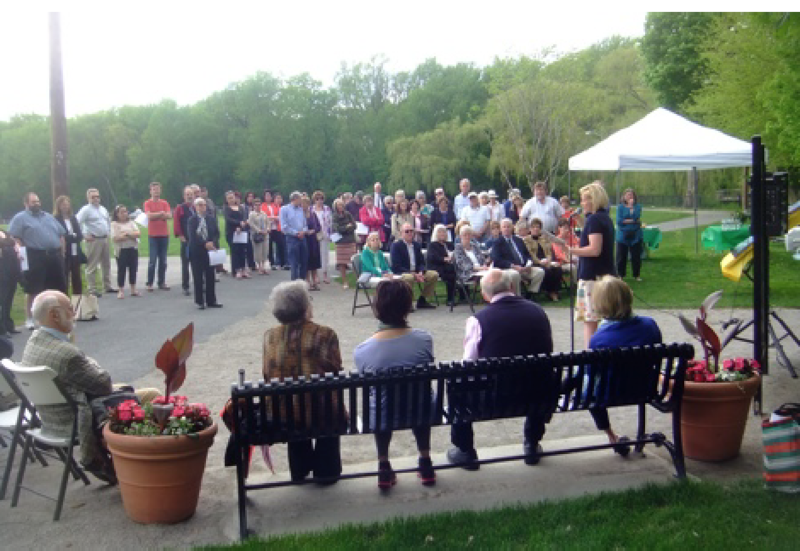 As we continue to partner with the Brookline Conservation Commission and the Division of Parks and Open Space as stewards of Hall’s Pond, and as we continue our involvement and investment in the maintenance, preservation, and protection of this unique Brookline resource, we hope that you will join us as members of the organization. The Friends organization is only as strong and as vibrant as our Board of Directors and our members make us. 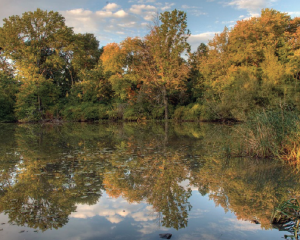 Whether you are a regular or a new visitor who seeks and enjoys the peace of the sanctuary in our hectic urban environment, or a landscape architect, landscape designer, or an environmentalist or horticulturalist who is fascinated by the diversity of our trees and our continuing quest to invest in and sustain native plantings. Perhaps you are a teacher who uses the sanctuary as a four-season classroom by following in Eris Doorneweerd’s footsteps and making the sanctuary an extension of the classroom. Or a birder who, as our board member Fred Bouchard says, “sees that through our assiduous and deliberate program of planting native species and uprooting invasive plants at Hall’s Pond, we continue to add a wider range of species to our local list.” You could also be a parent or guardian who knows that you do not have to leave Brookline to introduce your children and family to urban wildlife, just a short walk from Coolidge Corner. We welcome you to Hall’s Pond. The sanctuary is many things to many people, and in its diverse appeal is its preservation. AS NATURE GOES, there goes another giant. A great hole was created this summer in Amory Woods when some freak winds took down some huge limbs from the massive Quercus rubra (red oak) centrally located in the woods along the path. 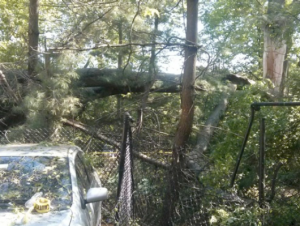 It smashed plantings and the fence along the Massachusetts Association for the Blind parking lot and driveway. 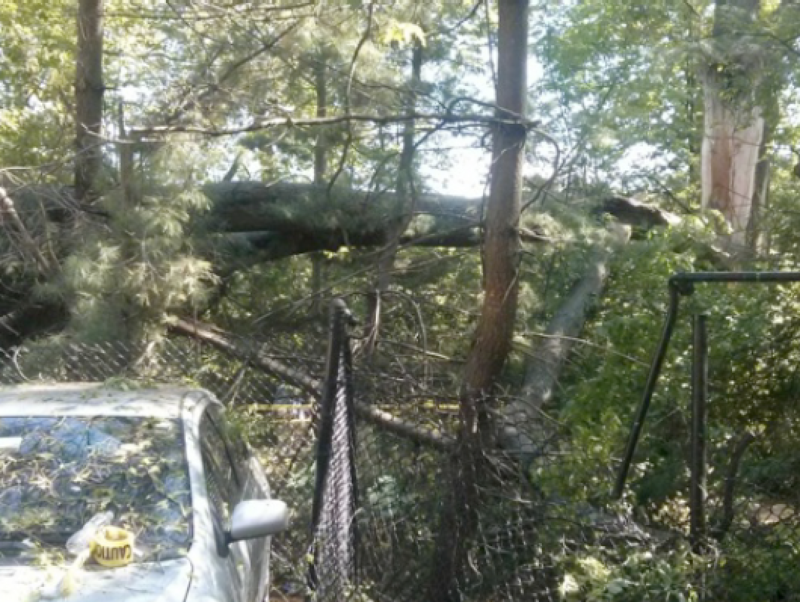 While some of the tree was left standing, it was deemed a safety hazard at this point and needed to be removed. The tree had to be taken out with a crane due to its size. As much of a loss as it is and was, it was also an opportunity. 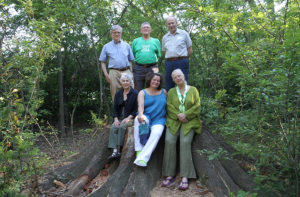 The Friends of Hall’s Pond coordinated with the Town of Brookline Conservation Commission and Parks and Open Space by using the Sanctuary management plan to replace appropriate plant materials lost by the absence of this one tree. The sanctuary management plan identifies this area in Amory Woods as Woodland with substantial overstory and large individual trees; limited shrub understory and groundcover; paths and bench. The goal in this area is to maintain big-tree woodland character. Using this reference, a plant list was decided upon. Some trees to provide canopy were placed including Acer saccharum (sugar maple) and Acer rubrum (red maple). Because of the size of the area needing planting a number of Cornus florida (native dogwood) and Cornus sericea (red twig dogwood) were added. Some Ilex glabra (inkberry or native native holly) and Osmunda regalis (royal fern). The smaller shrubs and ferns were added as placeholders. If this intervention had not been done, the area would have been vulnerable to unwanted plants. As the new trees grow and hopefully thrive, the smaller shrubs and ferns will not be as noticeable. All of these plants can already be found in the sanctuary and woods. 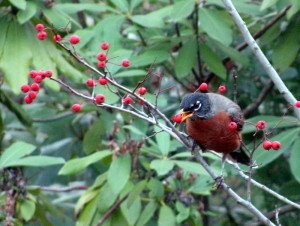 They have purpose in feeding and sheltering birds and other wildlife. Many of the shrubs were planted as border plants to help keep the mystifying character of Amory Woods and block out noise from the surrounding area. The great stump is still there. It is glorious in its size, come take a look. At a recent maintenance session, Brookline Park Ranger Alex Cassie aids volunteer Janet Wynn in digging out invasive plants. Please join us next year if you can. 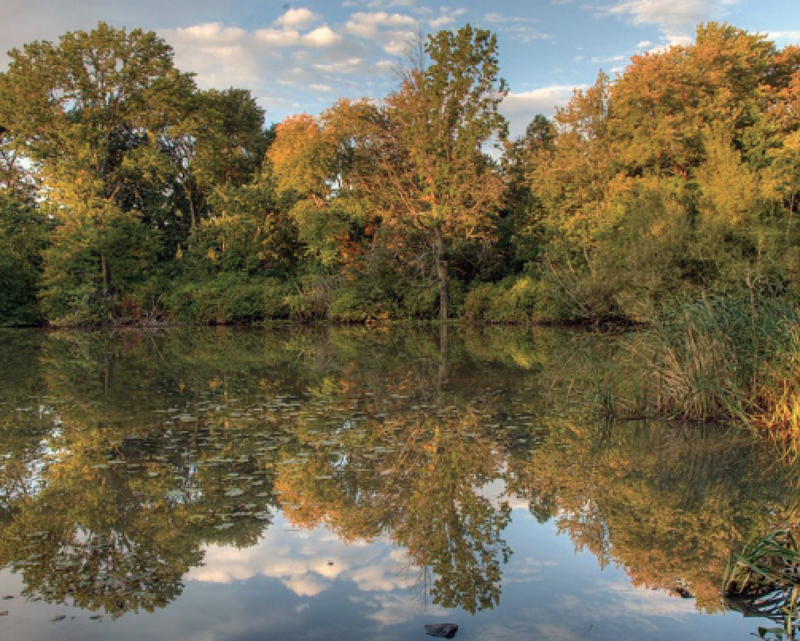 Tools are provided, and no experience is necessary—just the desire to help maintain Hall’s Pond. OUR VOLUNTEER MAINTENANCE TEAM helps to keep the Sanctuary and formal garden attractive throughout the growing season. Twice a month from spring through the fall, our volunteers groom the formal garden and combat invasive vegetation in the Sanctuary. 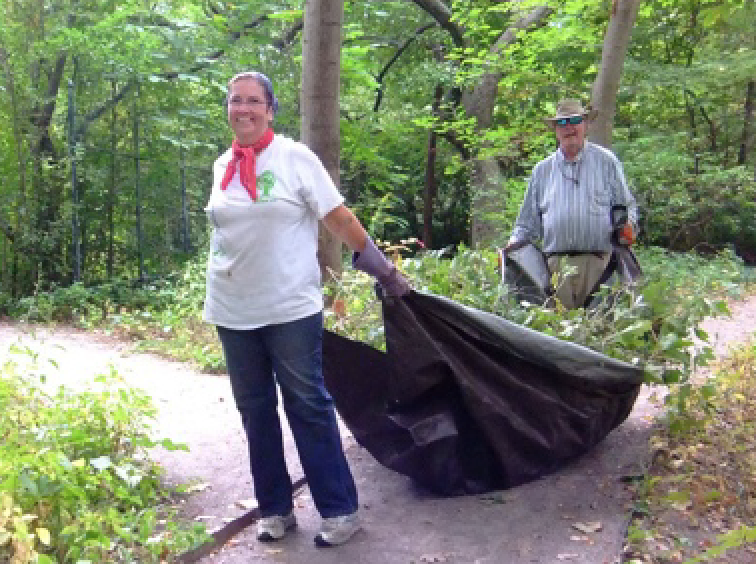 We supplement the work accomplished at the spring and fall Community days. All of the volunteer work is done on a small group basis with a plan for each session that is approved by staff of the Conservation Commission. 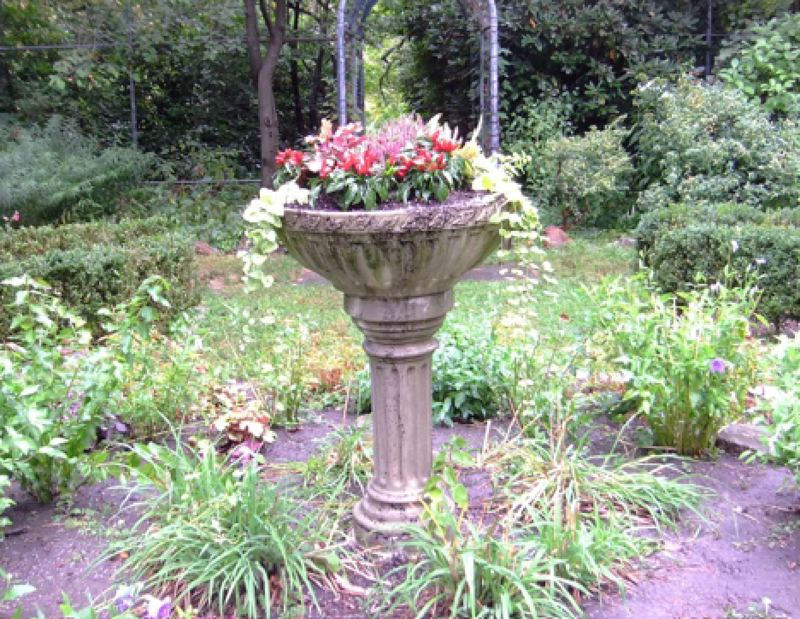 Marie-Claire Kamin has played a special role in keeping the urn in the center of the garden attractive. Ellen Forrester has supplied fresh plant material several times during the growing season and Marie-Clare has lovingly found homes for them in the urn. 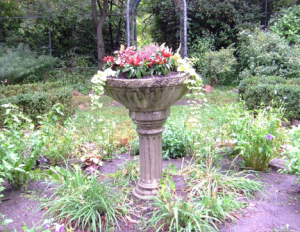 When it is time to revitalize the urn, Marie-Claire moves successful plants from the urn to the surrounding garden. 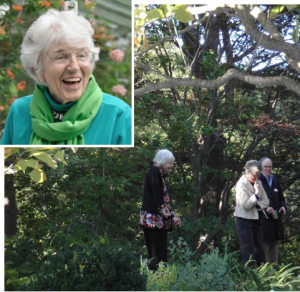 In this way, she and Ellen have kept the circle in the center of the formal garden looking interesting throughout the summer and into the fall. In Nan’s Meadow, we have expanded the planting of native perennials and shrubs. Some plants have taken hold well and promise to be a welcome presence for years to come. Since the Meadow is no longer mowed, we have to pay special attention to the invasive vines that are especially attracted to the edges of wooded areas. Porcelain berry, bittersweet, and black swallowwort are the major invasive vines that are eager to establish themselves in the Meadow. With very dry weather in late August and September, we put our expanded collection of hoses to good use. We now have enough hoses so that we can reach the entire meadow. We were able to save some shrubs that otherwise would have been lost. Because of our vigilance over the past few years, we no longer find large vines that have climbed high up into the trees. Consequently, we are able to attend to less dramatic threats to the Sanctuary. Some of our attention now is to 5-leaf Akebia, an attractive vine that was introduced by a neighbor for ornamental purposes. Akebia has spread along the ground and found its way to the pond. Along the way, the Akebia has engulfed shrubs that it has encountered. 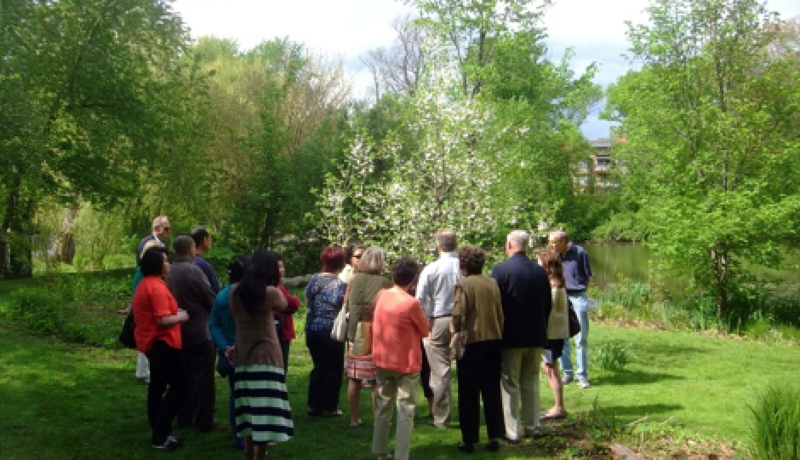 A major benefit for us in volunteering is that it involves us intimately with the Sanctuary from spring through fall. We experience the vegetation and the wildlife in special ways. We also learn a lot and get good exercise! We continue to rely primarily on a small group of volunteers who have been active for many years and who are board members. This group consists of Priscilla Smith, Janet Wynn, Harry Breger, Helen Herman, Bruce Wolff, Anne-Marie Kamin. We have a continuing need to expand our group of volunteers. We welcome newcomers and those who can come only occasionally. We provide on-the-job training to new volunteers. We find light work for those who want it. For those seeking physical challenges, we find assignments requiring vigorous effort. We communicate through an email distribution list. As much as possible, we schedule sessions at times convenient for members. Because most of our volunteers are retired, most of our sessions are on weekday mornings. 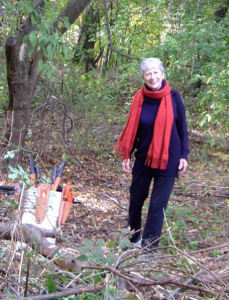 Marie Claire Kamin, a regular maintenance session volunteer, focuses her attention throughout the seasons on improving and beautifying the formal garden section of the Sanctuary. I WAS BORN from French parents in Cannes, France, in October 1935, the youngest of six children. I went to the French state schools, Lycees, and passed both parts of the Baccalaureates at the age of 18. Then went to Paris to study at the Sorbonne: Two years in French Literature, History, English and Psychology. My real interest has always been in Theater and I was, at the same time, accepted at the Conservatoire of Dramatics in Paris. I lived in Canada for several years where I married Leon Kamin. We later left Canada for him to teach and chair the Department of Psychology at Princeton University N.J. In my teaching I have always managed to use some of the theatrical training that I had, and the result was to give fun to both me and my students of all ages. I have three wonderful daughters: one in Paris is a professional Yoga teacher; one in Montreal has four children and is a Clinical Psychologist; my step-daughter has had a career in the Canadian Military Base as Head of the non-military personnel and she enjoys life now as a young retiree who often visits her old parents who love it! Plus we have 9—soon to be 10—grand-children and greatgrand- children! We live on the corner of St. Mary’s and Mountfort Streets and enjoy the beauties of the gardens around us in Brookline, mostly the Hall’s Pond Sanctuary that gives me a chance to get back to gardening—which I’ve always loved since early childhood, getting my hands and pants covered in mud! AS MANY OF YOU KNOW, our longtime Friends board member Nan Godley St Goar died on July 23, 2014. 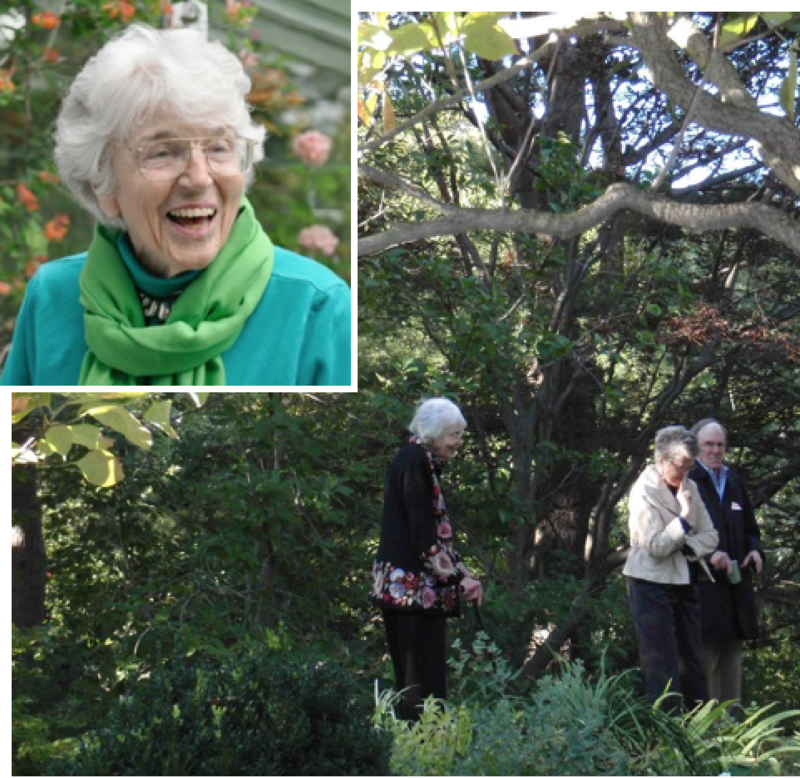 Just as we gathered at her home in 2010 on a glorious autumn afternoon to celebrate the Friends 35th year of Hall’s Pond stewardship, we gathered again this autumn in her splendid garden with her family and friends to celebrate her life and to say goodbye to our extraordinary mentor, unfailing supporter and gracious friend. We are deeply grateful to those who responded to her family’s request that contributions in Nan’s memory be made to the Friends. Please do come to the sanctuary and pause at “Nan’s Meadow” and remember a very special lady. The quote from Nan’s late husband Walter St. Goar printed in her memorial service reminds us all that “To know her is to love her.” We do, and we will remember Nan with gratitude and affection. Family and Friends gather at the new entry. ON MAY 18, The Friends of Hall’s Pond, the Town of Brookline Parks and Recreation Commission, the Parks and Open Space Division and Eris’ friends and family dedicated the Eris Doorneweerd Entry to Hall’s Pond Sanctuary in Eris’ memory. The bench and new plantings designed by Annie Blair, Landscape Architect for the Parks and Open Space Division in collaboration with Friends Co-President Ellen Forrester, now provides a welcoming and enhanced experience using all native plants. The new entry way honors Eris’ passionate commitment to the education of children about the natural world and her belief in the power of nature in the urban environment. Family and Friends gather at the new entry. Family and Friends toured the sanctuary following the dedication.